Todmorden-based studio group Fold, devastated following West Yorkshire's highest river levels in recorded history, bounces back with crowdfunding campaign. A local artist studio group has set up a JustGiving campaign with the hope of raising £10,000 needed to repair damage caused by flooding last month. Fold in Todmorden is run by artists and educators Colin Lloyd, Simon Ford, Kate Mellor and Charlie Meecham. The not for profit group offer local and international artists workshop space, and were in the process of transforming the facilities for wider public use, including disabled access. 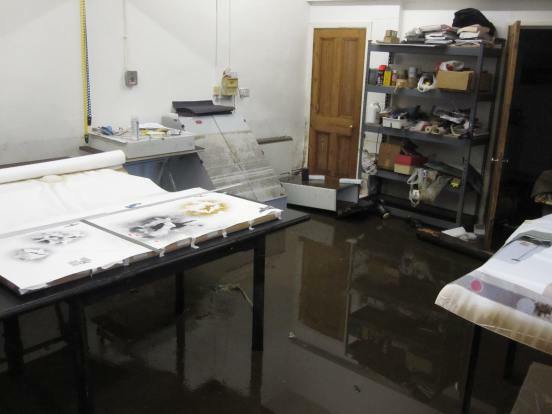 However, on 26 December the water levels of the nearby River Calder reached over four and half feet, completely destroying the studio’s digital equipment, print exposure units, art works, library, paper stocks and computers. It also caused damage to furnishings, fittings, plaster walls and doors. A large chunk of the money raised will go towards replacing the group’s large format digital printer, at a cost of £3000. The exposure unit will cost £1200, whilst £2000 is needed to fix the space’s walls, doors and disabled toilet. The aim is to relaunch the space in May 2016. In the meantime, Fold will be continuing with a range of collaborative projects external to the space.